Nchuand-Zel is a large Dwarven ruin accessed from inside Understone Keep. Understone Keep, the castle in the city of Markarth, comprises the exterior portions of Nchuand-Zel, which is actually a cavernous Dwarven castle carved deep into the mountain, being excavated under the direction of Calcelmo. The excavation area consists of a corridor running through two connected, square rooms, each with stone staircases on all sides. All staircases are blocked by crumbled stone except the one on the far left, which provides access to an area clearly being excavated. 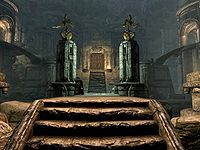 In the first chamber, in addition to the dwemer metal items and scrap lying around, there is an unlocked chest at the top of the stairs and rubble at the far end of the room. An excavated path leads to the next room, where there are two stone pillars in the relatively large cavern, along with excavation scaffolding that you descend. The shorter of the two has a respawning Dwarven dagger, a blacksmith's draught, and a piece of bent Dwemer scrap metal on it. You can jump down on to it from the ledge near the cart. There is a small unlocked chest at the top of this room to the right of the crumbled door which can be reached by jumping up the boulders above the wooden platform on the right. At the bottom of the room are some bones and several food barrels. At the top of a wooden ramp, by three of the barrels is an iron ore vein and a second vein found on the western wall. Three frostbite spiders precede a giant frostbite spider named Nimhe, who will descend through a large hole in the ceiling immediately adjacent to the entrance to Nchuand-Zel. Nimhe is the target of the quest Nimhe, the Poisoned One. There are two further iron ore veins found on the ground by the turning to the east and on the south wall a short distance further along the same section, while a corundum ore vein is found beside an egg sac that can be harvested for a spider egg. There is a second egg sac that can be harvested in the room you encounter Nimhe as well as the corpse of Alethius, who carries a note, which when read initiates The Lost Expedition quest. This quest provides the opportunity to re-activate Nchuand-Zel's automated defenses. The expedition consisted of a group of Markarth mages along with a guard of Imperial Soldiers that has ventured into Nchuand-Zel against Calcelmo's advice. Nchuand-Zel, a city under a city. Nchuand-Zel consists of a giant interior space with a central tiered walkway that provides direct access to Nchuand-Zel Quarters and Nchuand-Zel Armory, and indirect access to Nchuand-Zel Control (actually you can directly access control by standing on the raised cement slab near the cavern entrance and jumping to the rocky ledge just nearby, and using a little bit of strafe to get up the last bit). The floor of the central room is flooded, and much of the bottom walkway has crumbled, making navigating the room a bit difficult. Falmer have occupied the entire ruins, and can be found in the central room and in each of the three interior zones (see below). There are many Dwemer items found throughout every area of the ruins that will cause you to take many return trips to offload while exploring. It also makes this an ideal target for finding ten Dwemer cogs needed for Arniel's Endeavor. On entering a ramp descends. At the bottom there is a pressure plate that triggers a slicer trap from the right wall. Turning left, you will see it leads out onto a wide walkway over a huge open area with spiraling ramps leading down to different levels. Directly ahead and halfway to the first portico is a leveled Falmer. You will see several doorways at different levels to your right but ignore them for now. The first portico has a ledge to the left with a Falmer on it. With high sneak, this Falmer may fall off the edge if you take out the first with a bow. The ledge can be used to take out the remaining Falmer. Past the first portico, the path continues to a second portico that has three levels; you are on the top level. To the left, another Falmer is standing in front of an inactive Dwarven scuttle and may be difficult to see. There is a door to the left of that Falmer which leads into Nchuand-Zel Quarters. Ignore this for now and finish clearing this room. A ramp spirals downward from the back of the top portico to the second level, where another Falmer is standing. There is another ramp descending to the lowest level and a walkway heading east. Descending to the lowest level from the initial portico brings you to an adept locked gate with an unlocked chest behind it. Following the walkway to the east brings you to another portico, where yet another Falmer waits, with some human bones and a random battleaxe on the ground. If you continue past this the ramp continues down and enters the water. Just next to it (as you are now facing it will be to your right) under the water, is a door and behind this are two random potions. As previously mentioned there is a doorway to the Quarters on the south side of the top level To the west there are four doorways. The southern door has no ramp and is accessed through the Quarters section. Moving south to north there is a doorway on the lowest level to the Armory. the next door is on the second level which is the exit from Armory and allows access to the farther northern door to the Control section. Egress back to the ramp is via a ledge just north of that door. The normal route is to clear out the main room then start at the Quarters, go to the lowest level and exiting back to the main room to get to the Control section. It is however possible, although not advisable, to jump onto the exit ledge and do things differently or use this as a faster way when doing multiple loot trips. On entering there is a small alcove to the left containing several Dwemer items. The passage continues ahead and then turns right. Ahead you can see a Falmer, but be careful as down the steps, just out of sight there is a second one. Once these have been dealt with, you are now free to descend the stairs or continue straight ahead. It does not matter which direction you take first. You will end up in an area that has two dead Falmer, a set of stairs leading up, with a live Falmer on the stairs. There is a elemental rune trap at the top and two Falmer, one with a frostbite spider for a companion just beyond. It's possible to take out the one on the steps and have the others race into the trap often killing one, damaging a second and possibly the spider as well. At the top, on the right is a tree. The Falmer with the spider will be in this area if not alerted to your presence. If the trap is not sprung by the Falmer, hang as far right as possible to pass it. There is a table ahead with several Dwemer items and a bottle of wine on top and the body of Stromm, one of the expedition mages and two food sacks beside it. He carries his diary. To the right is another dead Falmer and two unowned bed rolls. There is a second elemental rune trap by the tree. From the stairs you can go left or straight ahead. To the left and following the passage as it takes a couple of turns leads to an area containing a single Falmer standing by a doorway into a bedroom containing a stone unowned double bed, with a Dwarven shield at the head of the bed, one of two dressers by the foot of the bed and a stone table to the left. There is a frostbite spider standing by another doorway into a bedroom containing four unowned single stone beds, a stone table and an unlocked chest. Opposite the first bedroom is a dining area with a long stone table with two metal benches on either side and two sets of shelves at the far end. Several Dwemer items including forks and spoons seem to have been dropped on the floor. Return to the junction at the top of the stairs. Straight ahead from the top of the stairs, there are several stone tables on either side, two metal units to the left and stone chairs all around. Through an opening there is a partially caved-in section on the right with the bodies of two Falmer and one of the Imperial soldiers on the left. The room at the end is a torture chamber and contains a torture rack with a wooden table beside it that has a random poison on top, several small cages and stone tables are around the room with many human bones and blood all around. To the left as you enter is a lever that activates a series of spears to repeatedly stab down over the table beside it. Once fully explored return to the top of the first flights of stairs and continue straight ahead. Continuing down the hall, ahead the wall has partially collapsed and you can look through a gap to see further ahead. It is possible to snipe through the gap at a Falmer or two and a frostbite spider, however this can alert a large number of Falmer to your presence, who then all converge on you and can lead to a fierce battle. To the left is a Falmer, at the top of some stairs leading down. To the right is an adept locked gate with an unlocked chest, a set of shelves holding a random helmet, several Dwemer items and an apothecary's satchel. Continuing down the stairs you will see four Falmer clustered together. High sneak and bows work wonders here as well as Frenzy spells. Past them the passage turns right and a flight of stairs lead back up. At the top and to the left is the Falmer with a frostbite spider you could see from the other side of the partially collapsed wall. To the right is another Falmer. At the top of the stairs, the passage turns right and climbs another flight of stairs before turning left and descending a ramp. At the bottom of the ramp is a door back out to a ledge in the main area of Nchuand-Zel with an unlocked chest. To the left is another room containing a final Falmer and left again is another unlocked chest. Now backtrack and take the exit out onto the ledge in the main area, you can drop into the water below and land near the entrance to Nchuand-Zel Armory, after collecting the items from the chest. Entering you will see a stairway straight ahead, a passage to the left, with a ledge above. There is a Falmer on the ledge and another at the top of the stairs to the right just out of sight. The passageway on the lower level leads to an adept locked gate that can be avoided. At the top of the stairs there is a flight of stairs to the right, with a Falmer and a chaurus patrolling up and down the passageway left to right. To the left is a flight of stairs leading back down, but take care as there is a pressure plate at the top that triggers a flame spout trap in front across the width of the passage. At the bottom the passage turns left again with another pressure plate in the middle that triggers a spear trap from both sides, the passage then enters a chamber. Below you is the locked gate that was avoided earlier. To your right, you will see several inactive Dwarven automatons on pedestals. There are two wall-mounted Dwarven scuttles, one on either side of the room, from which leveled Dwarven automatons can spawn. They do not spawn if you sneak past the openings. The first gate is unlocked and contains various metal items and an unlocked chest. The second gate has a leveled lock and contains a full set of Dwarven armor. The third gate has an expert lock and contains an unlocked chest, and the final gate is open and contains three sets of shelves holding a few plates. At the foot of the centurion is an unlocked chest and in front of this is the body of Erj, another of the mages from the expedition, and who is also carrying his diary. Nearby is a dead Falmer. The automatons are bugged (see here for details). Return back to the junction, taking care to avoid to both the pressure plates and keep going up the stairs. Through the door is a ledge and walkway in the main area. When you enter this area, there is an alcove on either side, past this the passage turns left then right before climbing a ramp. At the bottom is a pressure plate that triggers a poison dart trap fired from both sides. At the top is a Falmer you can see and another further back to the right that is hidden from view. At the top the passage turns left and extends away in front of you, partway along is another pressure plate that triggers a spear trap from above and at the far end are two more Falmer. On the left, near the Falmers is a stone table with an apothecary's satchel, a random two-handed weapon, and various metal items on top and an unlocked chest beside it. The passage turns left here, ahead is the body of Staubin, the last of the mages on the expedition, with his diary. Beyond his body the passage opens out into a large room containing a Dwarven spider. There are stairs to the east that lead up. As you start to climb several Dwarven automatons will appear from scuttles both ahead and at the bottom of the stairs. Once they have been dealt with continue climbing counter-clockwise, you will eventually find a Falmer fighting a Dwarven sphere. Wait for the Sphere to kill the Falmer, then take on the sphere alone. In the southeast corner, the room continues through a gap in some metal grating and another area, with a short flight of stairs opposite, keep continuing around to a table with a Falmer bow, two Falmer arrows, a leveled potion of healing and a lever that re-activates the automated defenses, opens a gate behind you and updates the quest. To the right is an unlocked chest. Through the open gate is a walkway with another unlocked chest at the end. This walkway is directly above the first passage in this zone, when ready simply drop down and exit through the door you initially entered through. On exiting back to the main room a battle is underway and the first thing you will see is the centurion now active fighting some Falmer. To your left is a column you can use to hide behind and let them battle it out. It's also a good position to take on the centurion, who nearly always wins, if you wish to. The abundance of Falmer usually results in them winning most of the other battles going on around the room. Deal with them as you see fit and you're done. To avoid fighting at all, there is a ledge to the left of the door which will take you back to the walkway at the start. There is enough scrap metal in Nchuand-Zel to make almost 400 Dwarven metal ingots. 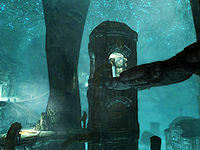 Nchuand-Zel has a small number of mini-Falmer that appear after the automated defenses have been turned on during the Lost Expedition, when the player returns to the chamber. They are about 60 percent of the size of their normal brethren, but just as powerful. If you stop just short of pulling the final lever, after 60 days (the test point, although 30 should be enough) the items (Dwemer loot, potions, mines, etc.) will reset in some sections but not others. The named dead NPC's bodies will be removed. In the Main Chamber, the Falmer will not reset but the loot will, as well as the chest on the south ledge accessible through the Quarters section. In the Quarters, the Falmer will reset but not the loot or chests. In the Armory, the Falmer and loot/chests reset. In the Control, the Falmer reset but not the loot nor the Dwarven spheres. Final treasure will still be intact. In the Armory, after looting the chest by Erj and destroying the two leveled Dwarven automatons that spawn, they will be unlootable. This page was last modified on 19 April 2019, at 22:14.